Before we get started, I’d like to note that it is February 28, and it is the final day of my 31-recipe challenge, and my final day of cooking. I have a few more posts to get out to be all caught up, but this is it. I want it on record that I HAVE made all 31 (well, 30) recipes in the 28 days of February. In the words of Top Chef, at the end of today it’s “knives down, hands up.” Done-zo. I was so excited to make this pudding. Butterscotch pudding…are there any two more beautifully paired words in the English language? It still looked nice. I can pretend, can’t I? Sure, I had encountered some curdling through the cooking process, but I didn’t freak…Jenn said that may happen, and if so, just our through a strainer before storing in the fridge. I guess mine wasn’t fine-meshed enough, or the curdling continued during refrigeration. I’m not sure. As for the grittiness…I got nothing. The caramel/butterscotch base (i.e., the molten sugar) was smooth and creamy, not grainy and sugary, so that’s not to blame. I’m out. Needless to say, I watched round two like a hawk–at exactly that five-minute mark, off the heat. And it was lovely. 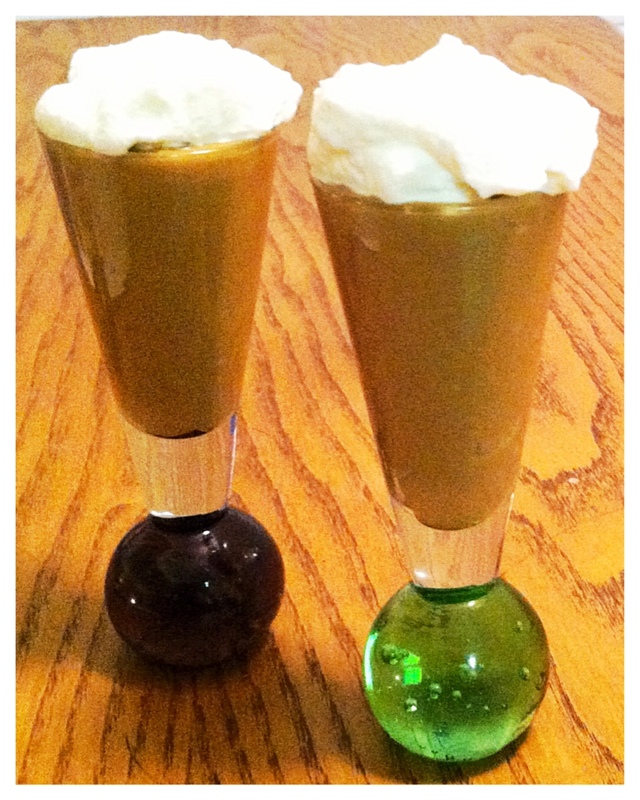 Anyway, let’s move on from this disaster that was (not) butterscotch pudding. On Tuesday, I received the Liebster Blog Award from Sherry at Cafe Vita! I’m so excited! My little blog finally got noticed, and this is my first-EVER blogging award! 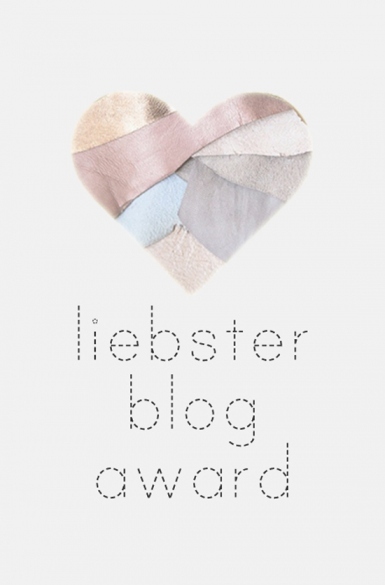 The Liebster Blog Award is given to new bloggers that only have about 200 followers. “Liebster” is German for dearest, loveliest or favorite. Go to their pages, tell them about the award and pass on the link to your post! So it is kind of a blogger chain mail. This is a nice way to hep promote new blogs and to get to know the owners. 1. I graduated Rutgers University in New Brunswick, NJ, with a degree in Journalism and Media Studies and a minor in Spanish. 2. While there, I also seriously considered minoring in dance (and auditioned to). 3. I currently live with my mother and my English Pointer named Nikki, and occasionally my younger sister. Four months ago, we moved out of the house we lived in for 21 years. 4. But, within the next two months, I will be living with my boyfriend Kevin and his/our yellow lab, Mackenzie. 6. I’ve lived in five different towns in New Jersey and one city in Spain (Valencia). 7. I am absolutely terrified of needles and crickets. 8. I’m very short. I’m just barely 5’1″ with shoes on. 9. By day, I work as a writer and web site administrator for a national political and public opinion polling company. 10. I’ve been a dancer since I was three years old. 11. I dye my hair. I’m a natural brunette, but dye it red. So now is the time to pass this award along! 2. What made you decide to blog? I was unhappy with where my life was 13 months ago, and I wanted to do something for me. I had toyed with the idea for a few weeks, so I just decided to jump in and do it. 3. What was the number one tool that helped you get started? I’m not really sure how to answer that…Wordpress? 5. What are your goals for your blog? I hope to reach out to people who share my passion for food, cooking and nutrition and I hope to expand my readership beyond my parents and my really bored friends. 6. How do you take your photos? Badly! Haha…on an iPhone (I knoooow). I try to set up some good lighting and staging, usually on my well-lit end table in my living room. Then I edit in PicStitch. 7. How much time do you spend per day/week on your blog or Facebook interactions? That really varies. This month, about an hour a day. Other times, much less. 8. What do you like most in a blog post from others? Humor, relatability, honesty, personal anecdotes and pretty photos. 10. Favorite blog? Peas and Crayons…she nails the factors I mentioned in #8, and sometimes I believe we’re kindred spirits. Congratulations to all the recipients, it was well deserved! Now, here are my 11 questions for YOU! 1. What’s the best advice you would like to receive from an established blogger? 2. What’s the best advice you would give to a new blogger? 3. What is your favorite cocktail/beverage? 4. Favorite guilty pleasure food? 6. Why did you start blogging? 7. If you could have dinner with anyone from history, dead or alive, who would it be and what would you ask? 8. Who’s your main taste tester/critic/support system? 10. What’s the biggest disaster you’ve ever had in the kitchen? 11. It’s almost spring! What’s the thing your most excited about heading into spring? Now it’s your turn! Copy and paste these questions into a new post and answer them, and then pass along the award to 11 more well-deserving bloggers! Have fun! And a major thanks again to Sherry from Cafe Vita for passing this award to me! Umm, actually, you nominated 3 Jersey girls. XD. I live 20 minutes from Rutgers, and I work in Somerset. You’re so sweet for nominating me! And you can totally leave the sweets to me.